Well, the short answer is I worked hard to get to having pain free days. 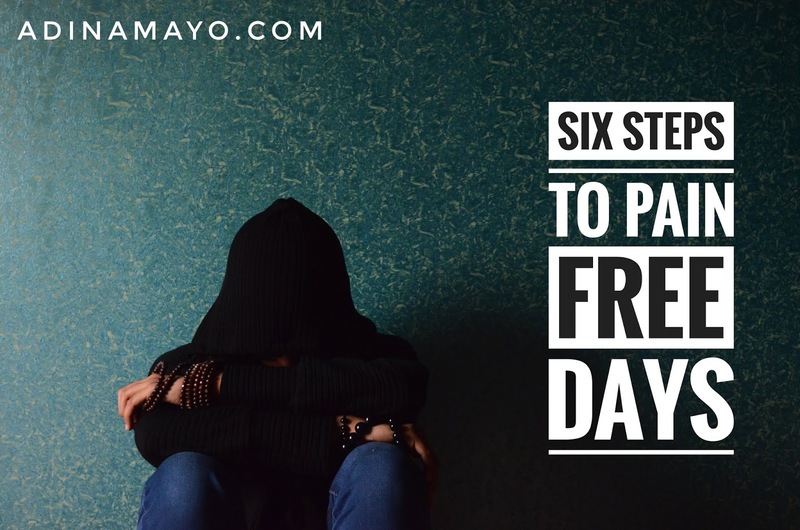 The long answer involves the process in which I got to a place in my life where I do have pain free days. 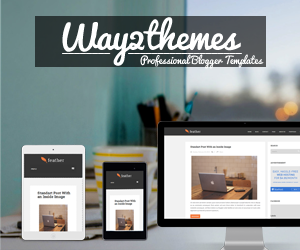 If you shop through any of my links in this post, you help support this blog at zero cost to you. Thank you for your support. If you are still in the "I don't know what's wrong with me but I hurt all the time" stage, then you need to start researching for yourself what you might have. You want to get a second and maybe even third set of eyes on what you have going on. One of the key things I did was switching to a new pain doctor. When I called they asked me what I was coming in for and I actually said I need a fresh set of eyes on this and don't want to have any preconceived notions of what may be wrong. The receptionist said ok and noted that in my file and gave me the paperwork to fill out. At the initial visit, my new pain doctor wanted her co-doctor to do an ultrasound of my areas of extreme pain to check for inflammation. If you've read my medical story, you will find out that I had none, and after checking my last MRI, he said you have Adhesive Arachnoiditis. Keywords from my MRI Report...nerve root thickening and clumping in the arachnoid at L4/L5. Once, I had my diagnosis I was able to stop doing the things that made it worse, namely spinal injections, overstretching, heat, and deep tissue massages. I found out that one of the many problems with arachnoiditis is spinal fluid not circulating properly so I got an inversion table. I learned to balance sitting, avoid standing at all costs and move frequently to keep the pain at bay. I learned to get a back brace for times when I may be sitting for a while or when I might be jostled. There is not a lot of information on how to deal with arachnoiditis so I looked at other diseases that were similar and what worked for them. I researched Fibromyalgia, Chronic Fatigue Syndrome, and MS. I developed my own program and system of getting well. If you want pain free days then you have to do the work. You have to be willing to change. That means commitment. Take Supplements - mine are prescribed to me from my functional medicine doctor, on top of the ones listed in the pain books above. Meditate - Get a meditation app or Read You are the Placebo and start meditation, I recommend Headspace, they have a 30 day medition on Chronic Pain. Get a Therapist - you need to talk and work through the new normal with a professional, chronic pain goes hand and hand with depression and while you may think you aren't depressed (I did for so long) you might be. 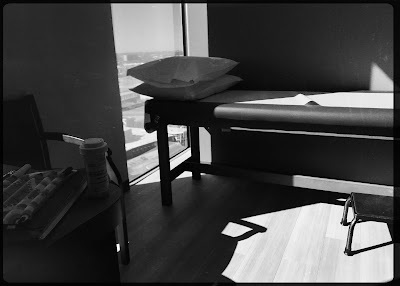 Try Alternative Treatment Therapies - find one or several that work for you - acupuncture, dry needling, e-stem, IFC unit, fasciablasting, dry brushing, inversion therapy, ice baths, etc. Your family has to be willing to change with you. It's a team effort. If #leohusband wasn't ok with me changing both of our diets, I never would have succeeded. You can't be in pain and cook two different meals. It takes a family meeting and loving understanding that your family wants you to not be in pain. They know that but airing out the logistics, concerns, and feelings in an open setting before you start your journey will go a long way if everyone is in understanding. Hey, it means you will all get healthy. Your family eating healthier will give them a boost in their energy and mood to help deal with the stress of being a caregiver. Plus, healthy food if cooked correctly is amazing and delicious. Here are a few of my favorite cookbooks to get you started. I kicked off my 'I'm going to get better or die trying' campaign in January of 2017. 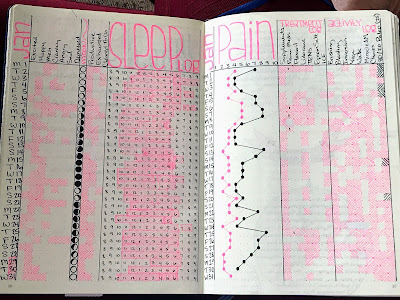 I kept track of my pain levels in my bullet journal so I could see actual, tangible results that this was working. Where was my pain? How many days in a row did I have pain? What days was I in a good mood? a bad mood? If you don't keep a record, you might think you are not getting any results. Because it takes months if not a whole year to see results. I went from two good days a month to three in the next month. The third month I had one good day a week and so on. 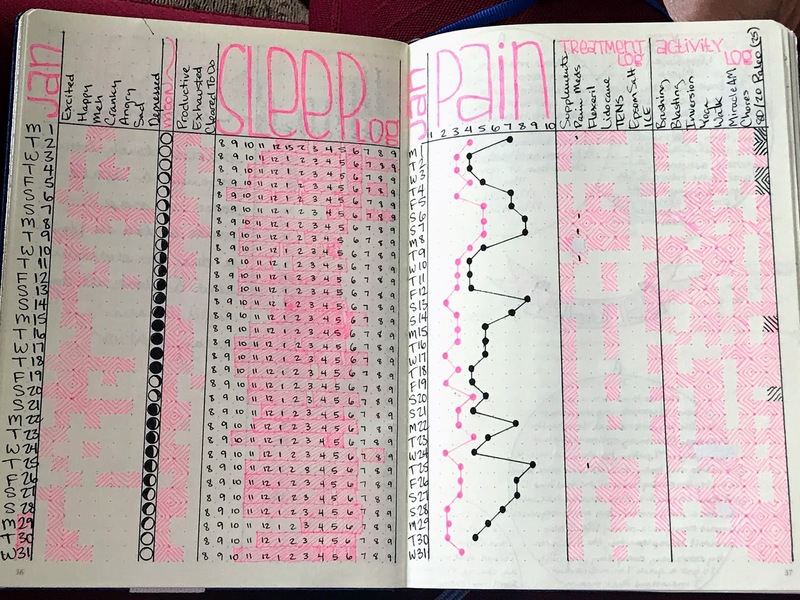 I started in January 2017 and by October of 2017, I was having five low pain days a week! However, without tracking, I would have given up. I changed everything and it was hell on top of all my pain. I hung in there by grit, determination, and support. 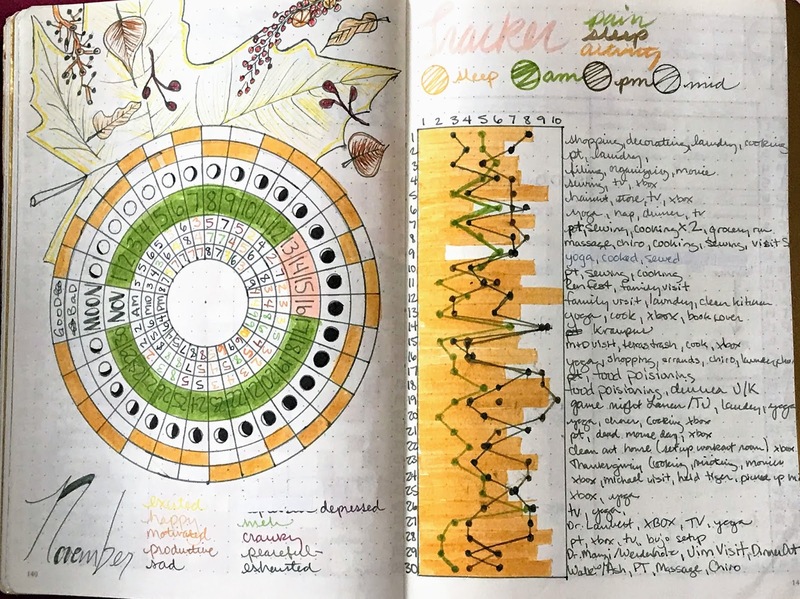 My bullet journal kept me on track, especially on the days when I didn't want to do all the things, my brain convincing my body that this was pointless and wasn't working. It was. I had proof. 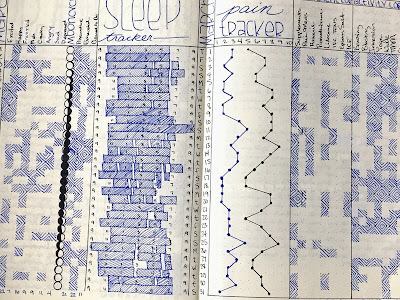 Bullet journals are also great to bring to your doctor with real data of what is going on! I'm happy to say that in January of 2019, I had five days of zero pain. That's huge. If you are not satisfied with your healthcare then find someone else. If every visit is stressful and in your head, you are telling that doctor to f- off, that's not a good relationship. You want a good, and knowledgeable primary care physician. I'm lucky in that I have one of the best in the country. He even knew what arachnoiditis was, that's how good he is. Having a doctor that is understanding and patient with you is key. I also see a functional medicine doctor and I recommend trying to find one near you. What a functional medicine doctor does is work on the whole picture. In the words of my functional medicine doctor, we can't heal the arachnoiditis but we can make your overall health better, which will help you deal with the arachnoiditis better. If you can't find a functional medicine doctor try to find a naturopathic doctor, you are wanting someone to advise you on what supplements to take and to make sure they do not interfere with any medications you are taking. 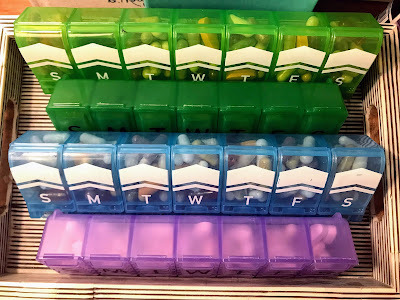 I started out with the usual thing all pain doctors start with, gabapentin. Ugh! The worst. It worked for a week and then the pain came back. Then they upped my dosage and it worked for a week and then the pain came back. I also gained 35 lbs on it and I started having weird side effects like rashes and bladder problems. Then they gave me Lyrica, which didn't work and one of the side effects is suicidal thoughts and attempts for a reason. It's dangerous and as far as I'm concerned shouldn't be on the market. Cymbalta gave me migraines. Nucyenta made me itch all over. Zipsor made me throw up. Some other pain patch gave me narcolepsy. Seriously, I tried it all. 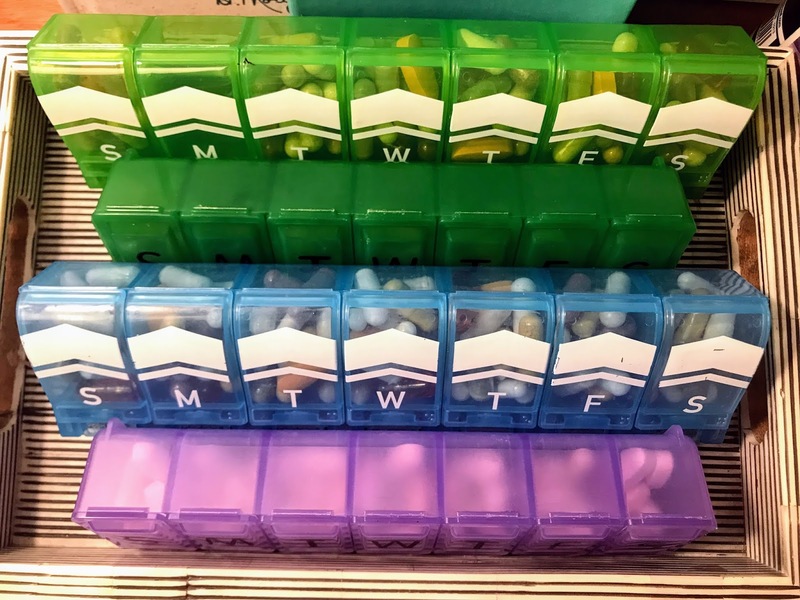 There are a lot of medicines out there and sometimes a medicine that is prescribed for something other than what you have can make a difference. For example, my PCP prescribed me .5mg of Xanax instead of Lunesta or Ambien for sleep. This was because in talking with me we determined that I needed help falling and staying asleep. Lunesta and Ambien help you fall asleep but not stay asleep. We also found that adding a low dose of a muscle relaxer helped with morning pain. 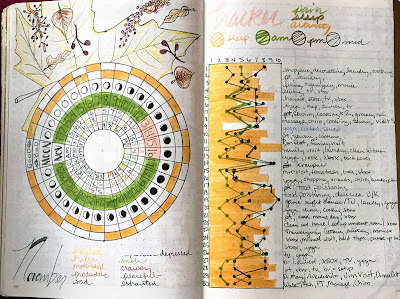 A few months later, talking with him we decided to give Wellbutrin a try because I was having PMDD - which I realized from my bullet journal notes. Unbelievably, the Wellbutrin really helped my pain. It was a definite turning point in my treatment. However, this is what worked for me, you need to find what works for you, and unfortunately, be prepared for the side effects that can occur. This is a good starting list but I know you are probably curious as to what I actually do on a day to day basis. That post is for next week my friends so stay tuned.